Nice Rack Canada has been working with Toronto based independent recording artists, Chameleon Project for 3 years now. We're honoured to build pedalboard systems for a very talented group of players who push musical boundaries every time they play together. The latest pedalboard system our shop has put together for the space funkateers is a Series Wired Double Board System for Guitarist Josh Laing. 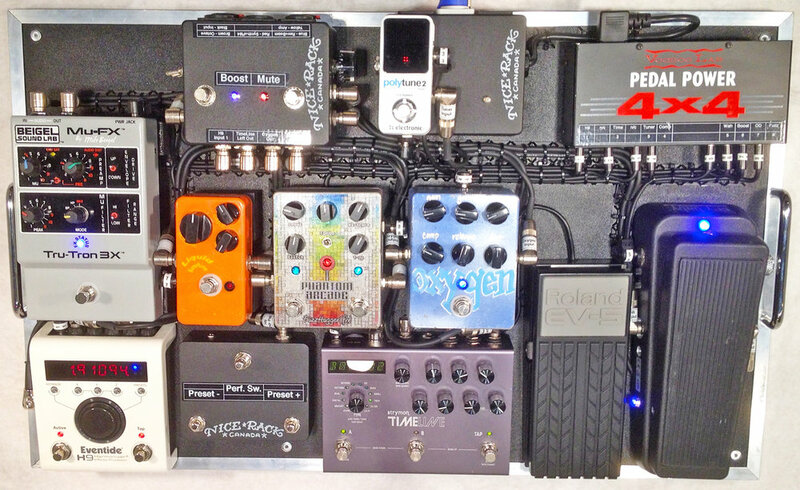 Josh's criteria for this system aside for great tone & unique signal order was to include splitting the palette of pedals into 2 separate boards for his "Traditional" & "Synth" guitar sounds. We included patching & switching functionality that allows either board to be used as a "stand alone" pedalboard if desired. Both boards are respectively powered by the standard setting Voodoo La Pedal Power 4x4 & Digital. System Design & Fabrication + 12VAC supplies for the Mu-FX TruTron 3X & Octave Divider built by Nice Rack Canada.